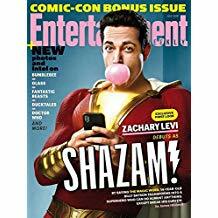 Entertainment Weekly Magazine keeps readers informed of the latest entertainment news. Entertainment Weekly goes behind the scenes to deliver celebrity interviews. EW gives readers a front row seat with its previews of what's coming to theaters and television, as well as exclusives on what's hot in music.